Nowadays, complex computers are integrated in numerous devices which are omnipresent in our daily life. They are deployed in diverse application areas, for example in the automotive, avionic, health-care, and industrial automation domain. These embedded systems are evolving towards complex interconnected and adaptive systems as so-called System-of-Systems or Cyber-Physical Systems. They increasingly integrate more and more functionality and must function under varying conditions and in diverse situations. For meeting the tight constraints under which they operate, these distributed embedded systems become self-adaptive so that they can adjust to varying context situations. This poses new challenges for the development of these self-adaptive distributed embedded systems. The design of self-adaptation needs to integrate with present development and requires consideration of the variable runtime behavior. For instance, many high-level functionalities, like Advanced Driver Assistance Systems of a modern car, are only required during specific situations and could be activated or deactivated accordingly. Model-driven development provides powerful means to manage the complexity of embedded systems design. However, available development methods do not consider runtime adaptation sufficiently, so that the potential of this flexibility cannot be exploited. 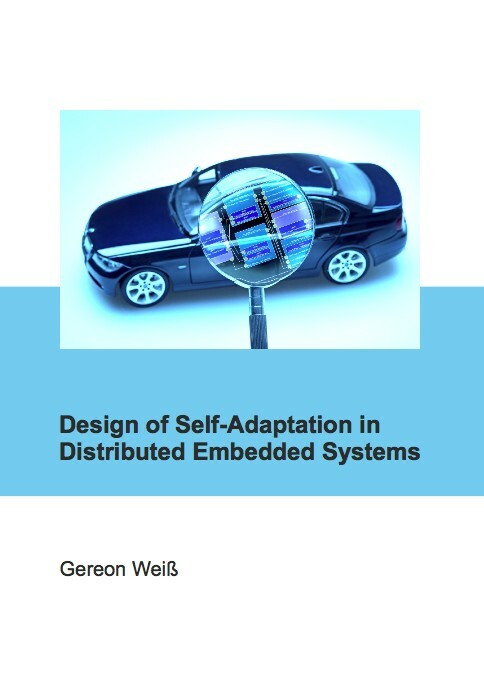 Therefore, this thesis introduces a novel model-driven approach for designing self-adaptation of distributed embedded systems. It enables the integration of self-adaptation in today's architectural design as a specific aspect. The presented approach is applied to the application domain of automotive Electrics/Electronics (E/E) systems which serve as representative example for future self-adaptive distributed embedded systems.